La dosis de soul ha sido suministrada sobradamente por el SoulShakers de Bamberg. 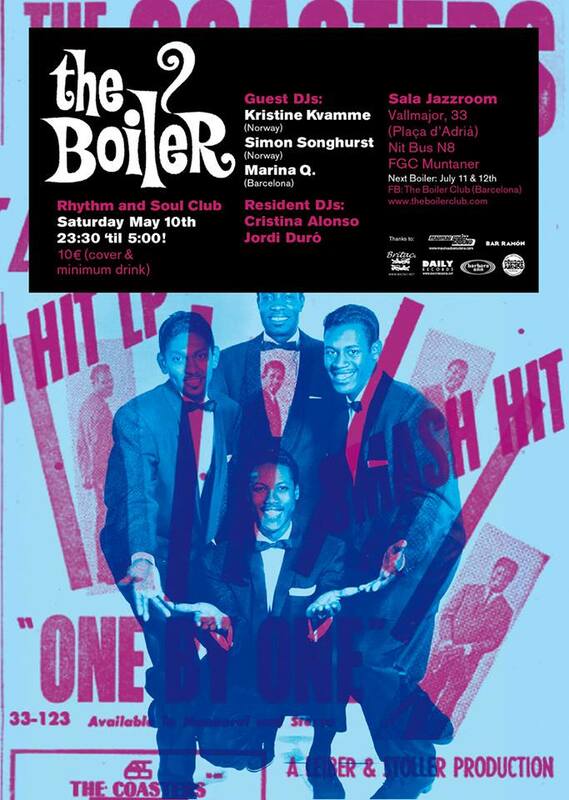 Pero aún queda la de rhythm’n’blues, y esa la trae The Boiler esta noche en Barcelona !! Hola! I’m Kristine from Oslo, Norway. For the last 7 years I’ve been one of the resident DJ’s at Klubb Magnus, Oslo’s longest running rhythm and soul club. I’m also co-hosting Miss Millie’s – a monthly 60s night in Oslo. I’ve been DJ-ing in the UK and in Norway for the last 10 years, and can be found behind the decks in one of Oslo’s many bars or clubs most weekends. I’m really excited about playing The Boiler, my favorite club in Europe! You can expect to hear a mix of R&B and both sweet and gritty soul. Basically tunes that I like to dance to at the moment! Hi all, I’ve been collecting R&B records since the early 80s, and started DJing in England in the late 90s at soul nights and mod clubs. For the last 8 years I’ve been living in Norway, where with Kristine and Simen Brekke, we’ve put on the monthly nights Klubb Magnus for 7 years and Miss Millie’s for 6 years. I’m also a resident DJ at Oslo’s Sugar Shack Soul Club, a monthly club playing 60s northern soul. I been to The Boiler Club a few times and I am really looking forward to coming back again, this time with a box of tunes to get your feet on the dance floor. See ya’ all soon. Attack in Lleida, Bluebeat Showcase in Rubí, Runaway Weekender and Upsetter in Granada, Boss Sounds to Beat the Ground in Segovia, Reggae Moonstompers in Köln (Germany) and Treasure Sounds in Hamburg (Germany), as well as other happenings in Madrid or A Corunha. These are some of the regular spinners that fill my case, but it’s rather impossible to sort them in order of importance. I hope to see you all in May 10th at The Boiler and spend another shaky and messy night together! Soy Marina de Barcelona y es un auténtico placer escribir estas líneas para la próxima edición de The Boiler Club. Como grandes programadores y mejores amigos, Cristina y Jordi han convertido este encuentro bimensual en uno de mis sitios favoritos del planeta, así que os podéis imaginar la ilusión que me hace compartir mis discos en familia y con la más entregada pista de baile. Soy amante de muchos tipos de música negra, desde el jamaicano y el rhythm’n’blues pasando por el northern soul. En mis sets me centro en el rocksteady y el early reggae de por ahí 1968-69, con especial debilidad por los uptempos vocales y las dulces melodías. También me gustan los contrapuntos con instrumentales donde reine el hammond y la percusión, así que habrá momentos para todo. He tenido la suerte de pinchar en allnighters y weekenders desde 2001: Double Barrel, Sweet Scorching Happening, BCN Dancecrashers o Boss Sounds Weekend en mi ciudad, Barcelona. Groove Attack en Lleida, Bluebeat Showcase en Rubí, Runaway Weekender y Upsetter en Granada, Boss Sounds to beat the Ground en Segovia, en el Reggae Moonstompers de Koln y el Treasure Sounds de Hamburg , así como en otros guateques en Madrid o A Corunha. Estos son algunos de los discos que llevo habitualmente en mi maleta, pero me sería imposible ordenarlos según importancia. Espero veros el 10 de mayo en el Boiler y pasar juntos otra noche agitada y revuelta.